Christian Ulvert creates political messaging for a living, and it's been interesting to see how people in the Village have responded on social media to Ulvert's campaigning, especially his ability to persuade folks that he's for all the things that they are for. He's is a skilled political operative whose had plenty of experience crafting political messaging on the fly, and so it stands to reason that when he shows up at someone's door, it's a pretty simple process - much like one of those phone psychics who can tell your fortune after a couple minutes on the phone - to figure out what the person is upset about, or what issues they support, and craft a personal message that will dovetail with their concerns. Moreover, it would be hard in the Village, based on the evidence exhibited by a lack of attendance at Council and other meetings and in the comments often voiced on social media, to find many residents who have a real grasp of detail about much of what goes on at Village Hall, or in the larger political world outside the Village where Ulvert has been a player for many years. 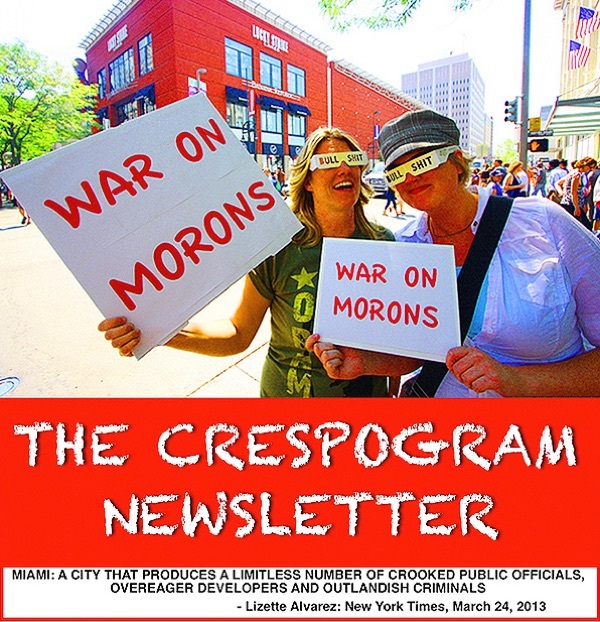 Consequently, most folks are unable to challenge Ulvert's rebuttals on the inside game involving the various lobbyists and political players that have surfaced in his campaign finance reports, but which I, having written about a lot of these folks and/or their clients during the last 10 years as they've operated in the City of Miami do know who they are, and why folks in the Village should be concerned that some of these folks have shown up donating money to a Miami Shores Village Council candidate. There has been some concern raised on social media about the discovery that Uber-Lobbyist Ron Book ($1000) gave Christian Ulvert money. It's a valid concern, in line with the concern that any village might have if Count Dracula showed up. But while Book always merits being watched, there are other folks who I would watch a lot closer, starting with Alexander Heckler ($1000), of LSN Partners, an attorney and lobbyist who I've written about for his failure to provide a copy of the IRS 990 Tax Return for the Host Committee that he and his lobbying partners created for the National Conference of Mayors on Miami Beach in 2017. You can read that story HERE. Heckler and his partners, including Jesse Manzano ($500), and Manzano's wife, Sarah Manzano who operates her own political consulting firm ($500), play in a lot of sandboxes, but they are connected, as is Alex Miranda ($1000), former Mayor Philip Levine ($1000), and current Miami Beach Mayor Dan Gelber ($1000) and Miami Beach Commissioner Marc Samuelian ($1000), by the fact that they represent a group that's had significant sway over Miami Beach politics for the last 10 years, starting with Levine's election as Miami Beach Mayor. In politics there are no coincidences, so the fact that $6000 in donations has come from this small group merits paying attention to. The $2000 donated by Heather Turnbull, and Rubin Turnbull & Associates, a lobbying firm created by Billy Rubin, who was considered a close pal of Governor Rick Scott, are also players who you would not normally expect to see playing in a wading pool like Miami Shores. Then there are the PAC's. In his first campaign finance report, Ulvert listed receiving money from several PAC's, including one that he created and controls Engaged Florida ($1000). Another PAC is the New leadership Network PC, created and chaired by attorney/lobbyist Jorge Luis Lopez ($1000). I written about both in my first story about Ulvert's campaign donors. HERE. In his latest campaign finance report, Ulvert lists Floridians For Public Safety ($500), which turns out to be another PAC that he is listed as being the Registered Agent for. In addition, he lists several more PAC donations, including Floridians For Better Government PC ($500), Floridians For Public Safety ($500) and Building The Bay PC ($500). Floridians For Better Government PC, is interesting because it one of a list of PAC's operated by Mark Herron, an election attorney in Tallahassee, who was involved in last year's efforts to convince the voters to approve Miami Mayor Francis Suarez's becoming a "Strong Mayor." 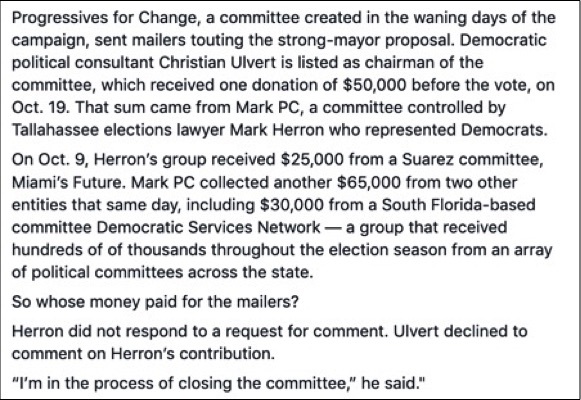 Here is a portion of a Miami Herald story on the role that deep pocket campaign contributors played in recent political campaigns in Miami that detailed both Herron and Ulvert's activities in the Suarez effort to become Strong Mayor. Below is the list of committees that Ulvert has Chaired, or been the Registered Agent for, and I have highlighted the ones whose records indicate have failed in one way or another to operate without being called on the carpet. 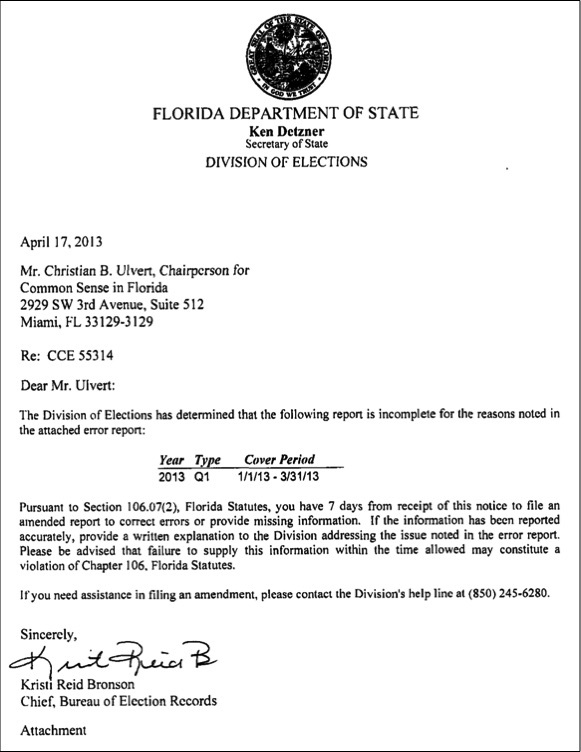 This response prompted me to go back and spend more time looking at Ulvert's involvement with various political action committees, and I soon discovered that the Florida Division of Elections didn't just revoke the certification of one of Ulvert's Committee's Of Continuing Existence (CCE), they revoked two (2). Here's the second letter. If Ulvert has had problems in the past with managing his own campaign committees, why should we believe that he'll do any better providing oversight to the Villages finances and activities? Of the 9 groups that Ulvert has been associated with, the the 4 that I highlighted have all had problems involving a failure to file timely reports and issues surrounding audits that resulted in two of them having their certificates of operation revoked. You can see the actual pages that details the reporting history for these groups by clicking HERE. Only the dog will have been eaten, and the questions will start of why anyone thought that it was a good idea to let the wolf in the park to begin with. I don't have anything personal against Christian Ulvert, but I am against putting wolves in dog parks, or letting scorpions ride on the backs of frogs if I can help it. And don't think that it's just Ulvert who I am opposed to. I don't think Jonathan Meltz has earned a 2nd term, and for all that Alice Burch has done, one should not forget the high-handed and illegal behavior that she engaged in while on the board of the Doctor's Charter School, that led to the investigation of the Miami-Dade Ethics Commission. The Village Council needs new people, new ideas, and people with a commitment to openness, transparency and accountability, and not a political operative whose more accustomed to working in back rooms than in the Sunshine, a lawyer whose first act on the Council was to introduce changes that would restrict the participation by the residents to speak and offer "informed opinions," in a process already already stacked against their participation, and a rich woman who keps thinking that if it's good for her and her friends it should be good for everyone else are not folks who should be given either a first or second chance to use the Village Council as an opportunity to open the door to his political playmates, an opportunity for a resume building, or as a way to stay busy. In addition to his Miami Beach pals, and money from PAC's controlled by him or his pals, Ulvert also received $1000 from lobbyist Eric Zichella, and $1000 from attorney/lobbyist Manny Priequez, along with $1000 from Ana Cruz, a Tampa lobbyist. Another $1000 came from political consultant Joseph Falk, and consultants Jackie Lee (Orlando), Brannon Jordan Lazo (Tampa), and $500 from political consultants Eric Johnson (Wilton Manors), and $250 from North Carolina political consultants Greenprint Strategies, Inc., and finally $100 each from Brian Goldmeier, Tim Alte and Scott Arceneaux. This comes to $18,050 in donations from PAC's and known political players, which is more money than Stephan Loffredo ($2450), Julio Martinez ($2500), Jonathan Meltz ($2275), and Miryam Rojas ($6,766) have raised, with another $4060 to spare. And all of this money has come from outside of Miami Shores to influence a Village Council race by a political operative who didn't even live here 2 years ago. In addition to questions about whose donated to Ulvert's campaign, some folks in the Village have, in a positive way pointed to Ulvert's political activities as a way for him to be useful in getting more money for the Village's many infrastructure problems. 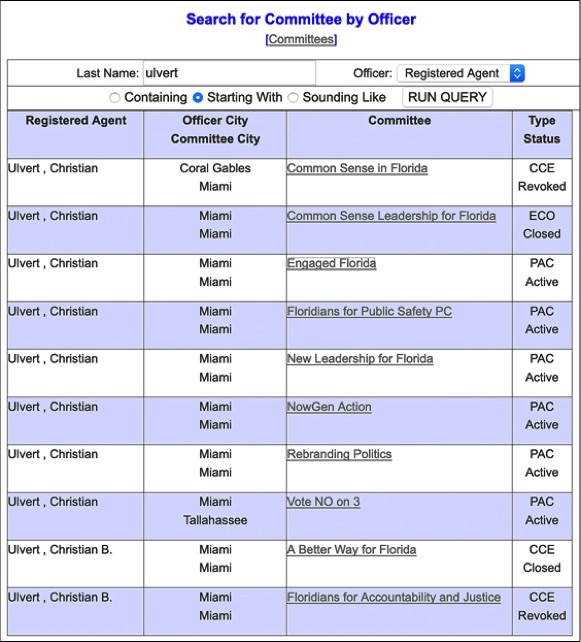 It's true that Ulvert is a player, but he's a Democratic player in a state where the Governor and Statehouse are controlled by Republicans, and where in 2016, he was behind the campaign to do away with campaign donations to Miami-Dade County Commissioners from companies and individuals doing business with the county, while continuing to allow labor unions to donate. It was a naked and dangerous effort that that was funded exclusively by out-of-state money funneled into the county by a Washington D.C. PAC, and that was stopped by the 3rd DCA before the referendum question could be put to a vote. The memories of the politicians at the county are on par with the memories of elephants when it comes to their remembering this scheme, and that it was Ulvert who was behind it. So, while Ulvert's a player, he doesn't have the juice that he would like people to believe he has, because in addition to his own activities, he's a Democratice operative in a state where most of local and state government is Republican controlled. His track record as a campaign manager isn't all that spectacular either. He was Philip Levine's campaign manager, and Levine couldn't win the primary even though he spend gobs of his own money. 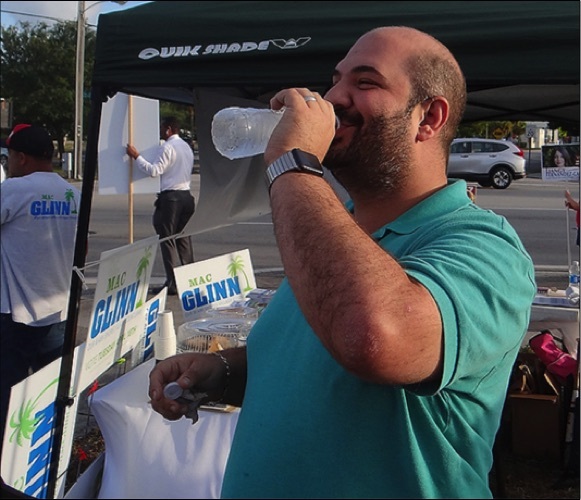 He managed Grace Solares in a Miami City Commission race, and she came in 3rd. He managed Jason Pizzo's State Senate campaigns , and Pizzo lost the first time, also after spending gobs of money, and only won this time because batshit crazy Daphne Campbell finally became too crazy and toxic for the political power brokers to continue supporting her. Speaking of Pizzo, there is no question that he's improvement on batshit crazy Daphne, but he's a freshman Democratic State Senator, and when it comes to divvying up money in committees controlled by senior Republican legislators who have their own districts to take care of, there can be hope of getting Miami Shores money for the library and for other projects, but we'd stand a better chance with a Republican State Senator, and a Republican State Representative than with a freshman state senator and state representative. I'm not advocating for any Republican candidates, but just stating the practical political reality of how the real world works. so while Ulvert might have the ability to call Pizzo and get the kind of fixing the potholes kind of services one gets from State Senators, so could the Mayor or the Village Manager. Putting aside the issues of sea level rise, septic tanks, traffic calming and what to do about the downtown portion of the Village, there is ample reason to believe that a major question, largely unspoken, but there none the less important question that concerns many residents this year and that is whether, and for how much longer should Tom Benton continue to be the Village Manager. Ulvert has made it clear that he supports the replacement of Benton, and that's the reason that the Miami Shores Police Department, Fraternal Order Of Police (FOP) union voted to support him. The enemy of my enemy is my friend. I too support Benton being replaced, and have felt that way since I wrote my very first story about his management of the Village in early 2017. But to me, the bigger issue is not removing Benton - he will in one way or another be leaving - but in the selection process that will follow for who replaces him. Contrary to what some people might believe, I do not expect that process to be conducted with openness and transparency. These kinds of decisions almost never are, and this is where a guy with Ulvert's history and backroom political experience could end up having an outsized influence in selecting who the next Village Manager would be, and where the fog begins to lift as to why so many outside political players have decided that investing in a candidate for the Miami Shores Village Council now, for the first time, seems like a good idea. Having a guy like Ulvert, with his history of political fuckery - and he does have that kind of history - as part of the decision making process for the selection of the next Village Manager, could result in him becoming a back seat driver in the process, while hanging out the window and giving folks the finger. In my March 20th story about Ulvert, I wrote about Citizens For Ethical And Effective Leadership, the Political Action Committee(PAC), that has been sending mailers to folks in the Village, and I also referenced Ulvert's own activities as the Registered Agent for a group that had also had it's certification revoked. I thought I had been both fair, and evenhanded in my story when I explained that, "over the years I've spent considerable time going through the financial information in dozens of these ECO's and PAC's and you'll find that it is almost impossible to find one that doesn't have a string of letters from the Florida Division Of Elections over one violation or another, and while it doesn't speak well for any of the organizations that does, the folks who put together these ECO's and PAC's often run out of time, money and energy to clean up the paperwork mess that they created in spending other people money for or against a candidate or an issue and just walk away at the end of the fight, as obviously both Ulvert and Citizens For Ethical And Effective Leadership did." Ulvert didn't see it that way and posted this comment on social media.